The Hungarian-born American mathematician John Von Neumann (1903-1957) was the originator of the theory of games and an important contributor to computer technology. 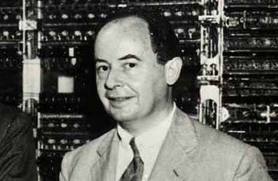 John Von Neumann was born in Budapest on Dec. 28, 1903. He left Hungary in 1918 and studied at the University of Berlin and the Zurich Institute of Technology. After receiving his doctorate in mathematics from the University of Budapest in 1926, he attended the University of Göttingen for a year. Göttingen enjoyed a tremendous reputation in the mathematical sciences: the great master and inspirer of generations of students, David Hilbert, had not yet retired, the "ex-prodigy" Norbert Wiener was a visiting fellow from the United States, and the university was the meeting ground for many brilliant young scientific intellects. One of Von Neumann's fellow students was the future atomic scientist J. Robert Oppenheimer. Von Neumann taught mathematics at the University of Berlin (1927-1929) and the University of Hamburg (1929-1930). Then the young Hungarian, like so many others at that time, found refuge in the United States, obtaining a post at Princeton University, where he taught mathematical physics until 1933. He had been working on quantum mechanics for a number of years, and his book on that subject, published in 1932, provided a useful exposition of the mathematical logic of the theory. However, Von Neumann had already developed a theory which was to be potentially of much greater value but which was not fully developed for nearly 20 years. In 1927 he propounded a mathematical technique for the analysis of conflict, but it was only in 1944 that he and Oskar Morgenstern wrote the celebrated Theory of Games and Economic Behavior, which had a profound influence on the development of strategy in widely differing fields of application. The theory of games is a concept which can be applied to the logic of conflict; it is an attempt to provide a quantitative basis for rational behavior in a situation which has conflict potential. This purely mathematical technique has developed as an important subject of study for its economic, social, political, and military applications. In 1933 Von Neuman became professor of mathematics at the Institute for Advanced Study in Princeton, a position he held until his death. During World War II he played an important role in the field of applied mathematics devoted to military needs and worked on the motion of compressible fluids caused by explosions. He was a consultant at the Los Alamos Scientific Laboratory (1943-1955), where his extraordinary intellectual grasp coupled with common sense were of considerable influence. Having seen the potential of high-speed machine calculation in these problems, he studied the mathematical logic of computers and their complex technology. The first computer at Princeton was built in 1952 under his guidance. The U.S. Atomic Energy Commission placed him on its Central Advisory Committee in 1952 and made him a commissioner 2 years later. His interest in computer technology continued until his death on Feb. 8, 1957, in Washington, D.C.